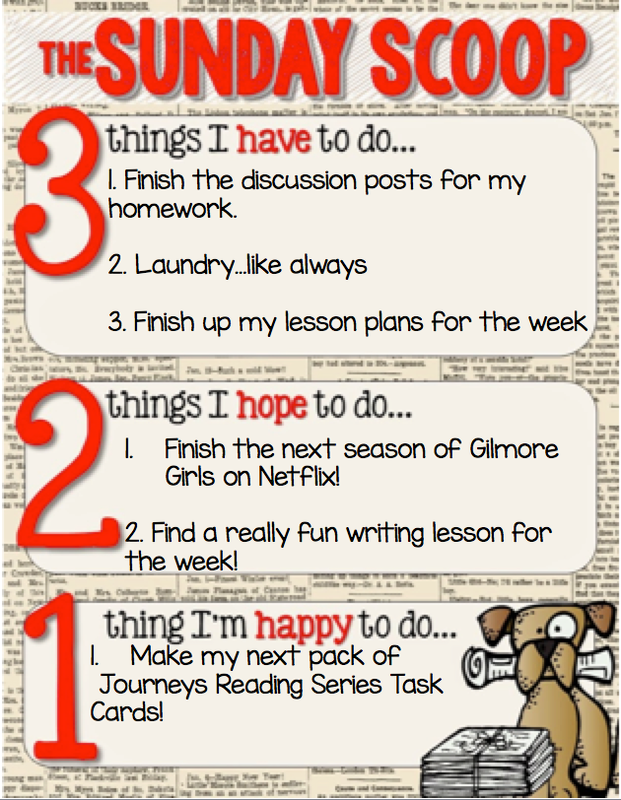 I'm linking up with the Teaching Trio to give you my Sunday Scoop! I'm not doing a whole lot today, but there are some things that need to get taken care of! Gilmore Girls is a favorite of mine. My sister-in-law has all 8 seasons on DVD. I watched them when my daughter was a newborn. She DID NOT SLEEP much, so it was either watch Gilmore Girls or fall asleep holding her. Have a great week! Thanks for stopping by:) Have a great week also! I LOVE the Gilmore Girls! I try to watch old reruns whenever they are one! :) You are now the second or third blog that I've read this morning where laundry was on the to-do list. Must be a Sunday thing? Hope you had a great weekend and a wonderful week coming up! Gilmore Girls is just so addicting! I couldn't wait for Tuesday nights in high school! Laundry is pretty much on my list everyday, one day I will get it checked off the list:) Have a great week! I've been watching Gilmore Girls on Netflix too! I love that show!! I hope you get the chance to finish the season. It is nonstop! I am addicted all over again!! Have a great week! I love Gilmore Girls too! I will be spending my Sunday getting caught up on laundry too….it is never-ending. We have been focusing on how-to writing, and my second graders loved writing about how to make a root beer float last week. We watched a short youtube video to build background knowledge since some students have never made one before. What a great idea! My students are about to earn a Potato Head party(we put pieces on a potato head to earn a class party) and a float party would be perfect! Then I could mix writing in there too! Thank you for the wonderful idea!!! Well, the laundry in blogger land seems to be endless! When my kids were little my husband put a load in every morning on his way out the door and when I got ready to leave that load was ready for the dryer. I think that's how I survived with kids! I am sad to say I have never watched Gilmore Girls! Well I found your blog on the link up and I am your newest follower! Although most of my laundry is completed, now it is on to getting everyone's clothes lined out and ready to go for the week. If you get a chance stop by my blog and check it out!! Thanks for sharing! I love Gilmore Girls! I watched quite a bit of reruns this past week while I was home on Fall Break! Thanks for linking up!